The “Eero replaces your router and blankets your whole home in fast, reliable WiFi.” This is how eero describes its WiFi system, and we couldn’t think of a better way to put it. If you find yourself continually rebooting your router due to dead spots, endless buffering, and other WiFi annoyances, the eero could be your solution. The eero is one of the best WiFi extenders available. Read our full eero review to learn more. The eero is a luxury WiFi booster that creates multiple access points for internet access. It is our vote for the Best Luxury Overall WiFi Extender. Our eero review will go over everything you need to know if you’re considering purchasing this booster. 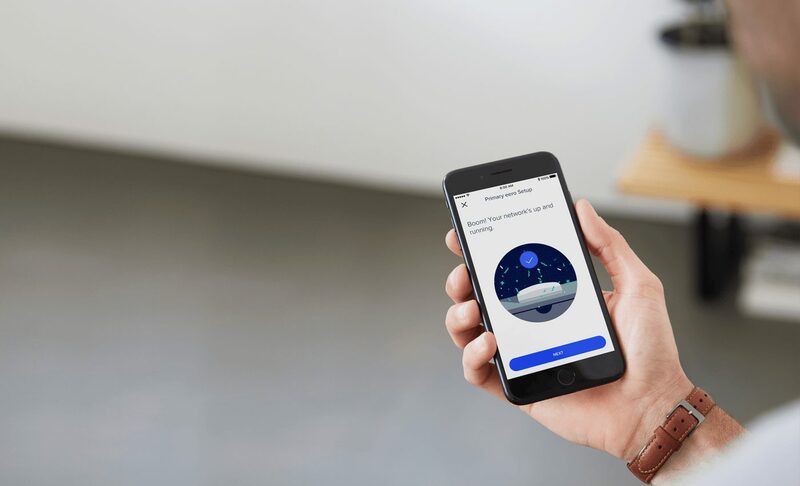 The eero system uses a tri-band network to broadcast the router signal to beacons spread throughout your home, which allows the system to use the full breadth of the 2.4GHz and 5GHz bands. For you, this means better throughput for all of your connected devices. Similar to the NETGEAR Orbi, the eero is a wireless mesh system. A mesh system is more complicated than a simple WiFi extender and has several units, including a router and extenders. 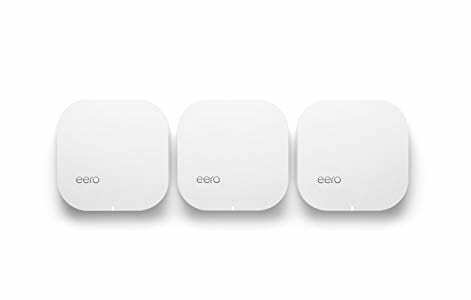 Three small, easy-to-use eero devices typically cover a home (one base and two beacons). Alternatively, you could do one eero for every 1,000 square foot. Have a larger home? No problem. Just get more beacons. The number of beacons you can sync to your main eero are endless. Aesthetically pleasing: Some WiFi extenders are bulky, unattractive, and stereotypically electronic looking. The eero is not. Its units are white and sleek, not unlike Apple products. They also blend well with their surroundings. Automatic software updates: This system has automatic software updates. You’ll never have to keep track of updating your WiFi extender, and you’ll always have the latest security updates. 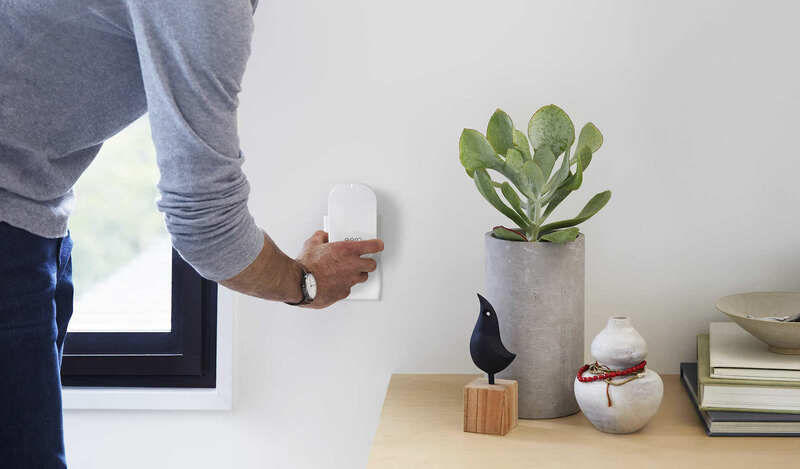 Simple set-up and use: eero has an in-app control network that makes setting up the units as simple as possible. Uninterrupted connection: eero helps enable strong, continuous WiFi throughout large areas of space, partly because of its tri-band system. 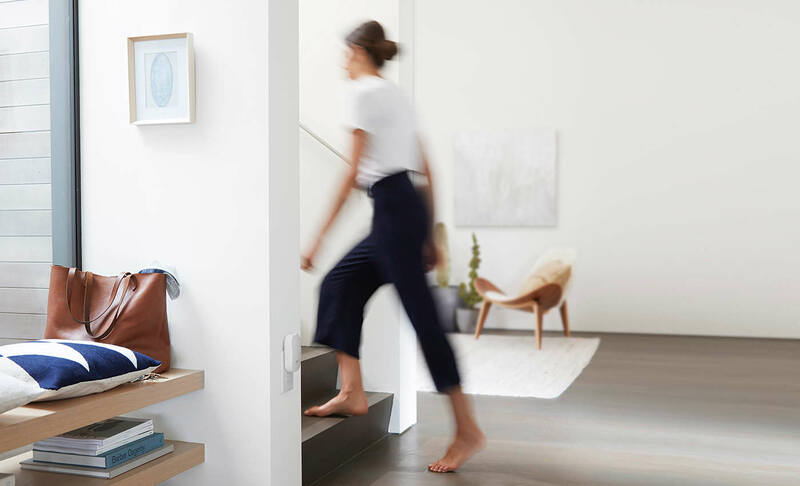 Unlimited beacons: A three-piece eero system can cover up to 4,000 square feet of living space. If you live in a home larger than 4,000 square feet, you can purchase more eero beacons and extend the coverage. Voice controlled: Currently, Eero is the only WiFi system that allows voice control. If you enjoy being able to talk to your WiFi extender, this is the best unit for you. High cost: The units for this system are more expensive than other WiFi extenders on the market. Looking for a cheap, basic WiFi extender? This isn’t it. Slower speeds: eero doesn’t provide the fastest internet amongst the WiFi extenders we reviewed. If you usually get 200 Mbps or faster download speed, you may be disappointed because the eero won’t be able to maintain that speed. No ethernet ports: These units lack ethernet ports, which is okay for most people. 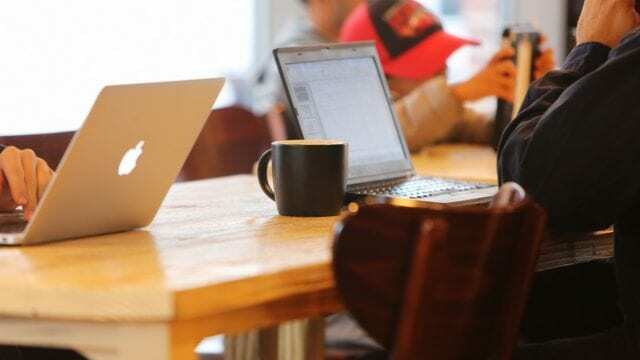 However, if you want to hook up a printer, smart TV or gaming device directly to your WiFi unit, you’ll want to pick a different kind of WiFi booster. 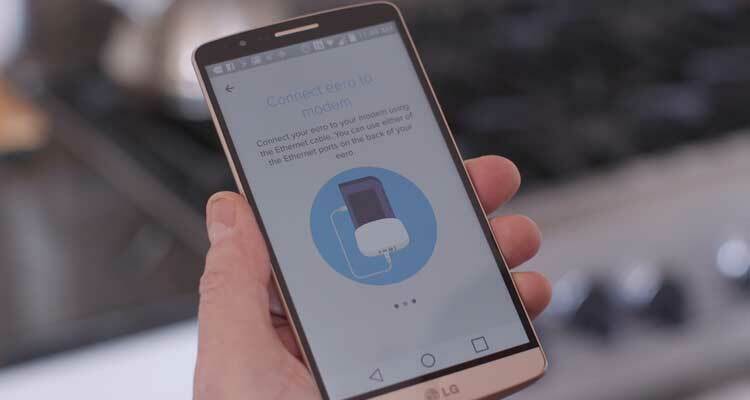 Smartphone required: Most people have a smartphone, but if you don’t, you won’t be able to install your eero system. Unit makeup: Eero says its units were designed to achieve the best performance while being as small as possible. Inside the beacons, you’ll find a dual-core 1 GHz CPU, two 802.11ac Wi-Fi radios and seven antennas. This WiFi booster system has a lot of great features. This section of our eero review will go some of these elements in more detail. You can also ask Alexa to have eero pause the internet, turn off its LED lights, and more. However, the Alexa/Eero integration only works in one direction. While it can pause the internet and turn off the LED lights, the system cannot turn the internet or LED lights back on. To do these actions, you will need to login to your Eero app. 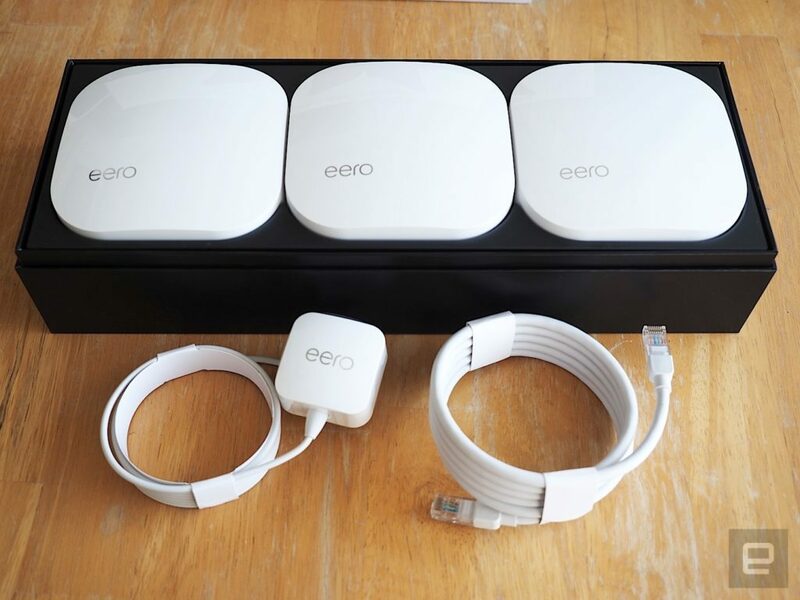 The eero company recommends starting with its three-unit package and adding on from there if need be. The system has gigabit WiFi speed capability and enables you to configure DHCP, NAT, VPN passthrough, DNS, UPnP, Port Forwarding, Static IP, and parental controls. The eero system consists of three identical hardware units that work in unison to deliver fast, stable WiFi to every corner of your home, regardless of how far you are from the router. At the core of the products is TrueMesh, the software and mesh routing algorithm. Setting up your eero is simple and should take less than 20 minutes. This section of our eero review will go over the instructions to set up the system. A smartphone: Apple iOS 8.0 device or later or Android smartphone or tablet running 4.3 or later with a data connection. You will not need a router because the eero includes one. Download the Eero app (either from Apple’s App Store or Google Play). Register an account with eero. Sign in and follow the on-screen steps. Find the eero beacon that is labeled “Start” and connect it to your modem/router using the ethernet cable found inside the box. You may need to disable the routing function with certain modems. Wait for the app to automatically detect the eero beacon and guide you in setting up your Wi-Fi network. You will need to name each beacon. We recommend naming them according to their location (examples include Office, Kitchen, Living Room, etc.). You will also need to create a password, and some ISPs may require extra steps. Tap “Add Another eero.” Wait for the app to guide you through Yideal placement options. Once you have found the best spots, plug the beacons in and follow the instructions to connect the beacon. Repeat step 6 for any additional beacons. Most WiFi boosters have a one-year hardware warranty, and eero is no different. The eero company provides a one-year limited warranty that covers your system. If something breaks within one year of purchase, the company will exchange or refund your defective eero at no cost to you. After our full eero review, we think this is one of the best WiFi extenders on the market, particularly if you have a large home or area needing better WiFi. 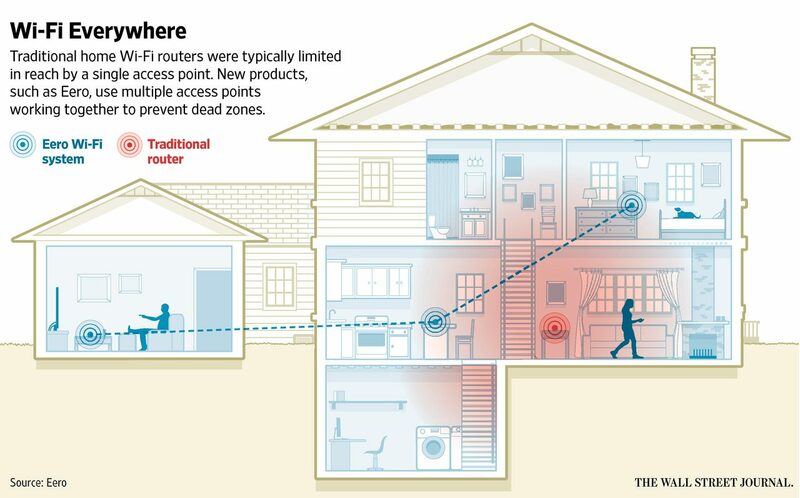 It’s a router and extender in one, otherwise known as a mesh system. It also features a sleek design and is unobtrusive. If you are looking for reliable, strong, consistent WiFi in every corner of your home, eero is your best WiFi extender option. However, smaller homes and apartments may not need all of eero’s power, and the price might be too high for people looking for a simple option. Overall, however, we highly recommend the eero WiFi extender. Do you use this WiFi booster? If so, leave your own eero review below. How Do WiFi Boosters Work? Why Do I Need a WiFi Booster? I heard a lot of complaints before the Eero went in. Speeds in the back room were terrible, and there were up to 8 devices sometimes, so having a Beacon there really helps. Setup is generally straight forward, I needed to do it twice for some reason. I'm using an Arris modem and router with a separate powered AP that I disconnected. Kept both networks active and the Eero assigned itself a different internal network automatically. The App is well thought out and makes managing the network easy. Good for challenging wifi. My walls at my home are plaster not drywall and wifi signal could not get through the wals to all the rooms. I was recommended the Eero. It worked perfectly. I was considering spending $2000 plus to hot wire my house. The Eero did it all at a fraction.